You shouldn’t miss a day trip to the Cape Winelands, when visiting Cape Town. Most people will head to Stellenbosch or Franschoek. Dare to be different and visit the Somerset West Winelands, on the slopes of the Helderberg Mountains and at the foothills of the Hottentots Holland mountain range, and this is one wine tasting experience you won’t forget in a hurry. Three different wine routes take you through the Somerset West Winelands: Schaapenberg route which features wine estates in the immediate vicinity of Somerset West, the Helderberg Foothills route closer to Somerset West and the Helderberg Annandale route north of Somerset West along the R44 towards Stellenbosch. 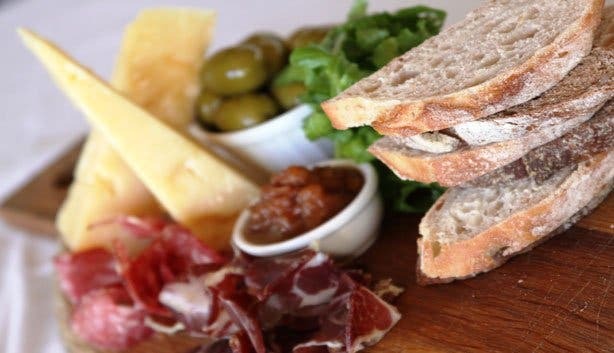 Each wine route has its own charm and characteristics, but the three Somerset West wine routes have one thing in common: gorgeous wine estates on the foot of the Helderberg and Schapenberg mountains, serving mouth watering wines unique to the variety of terroirs in Somerset West and Surrounds. But what makes Somerset West so unique? The wine region is often referred to as South Africa’s premium red wine area. Shiraz, Merlot and Cabernet Sauvignon are popular wine blends in the Somerset West area due to the warm ocean influence, moderate rainfall and sheltered grounds in the shadow of the Hottentots Holland mountain range. The Schaapenberg route is the most southern route of the three Somerset West wine routes, just east of Somerset West. The Schaapenberg vineyards are close to the Atlantic Ocean, so the wine estates benefit from the cooling sea breeze, all year round. The wine farms reach a height of 100 to 200 meters which contributes to the delicious flavours of the red and white wines from the Schaapenberg region. Popular wine blends from the Schaapenberg vineyards are; Cabernet Sauvignon, Sauvignon Blanc and Chardonnay. Drive down the R44 towards Somerset West and onto the M9 and enjoy the beautiful view of False Bay. Your first stop on Lourensford Road is Vergelegen Wines. Since 1685, Vergelegen wine estate has been cultivated with grapes, fruit trees and vegetables. With the Schaapenberg Mountain in the background, the lush gardens make for an ideal picnic setting. Enjoy a glass of Vergelegen Red (Vergelegen’s flagship wine) during the cellar tour, at the Vergelegen Restaurant, or on the rose terrace. Vergelegen wine estate has two other flagship wines: Vergelegen V and Vergelegen White. Next to Vergelegen Estate and the Erinvale Golf Estate lies Lourensford Wines. This wine estate, founded in 1700, is still going strong and continues to produce award winning wines including; the Voignier 2008. The Chardonnay 2008 is one of the top ten Chardonnay’s in the world. Opt for a wine tasting experience and take a look inside the Lourensford wine cellar. 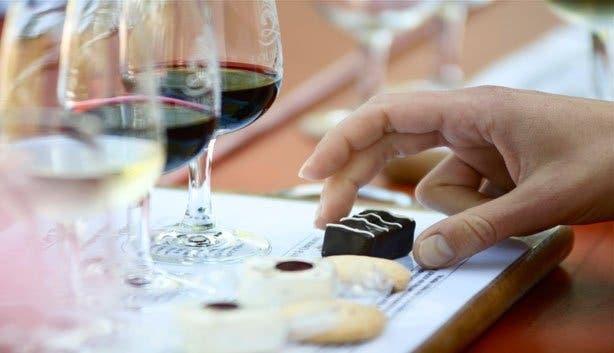 Food and wine pairing is also an option on the Somerset West wine estate: try accompanying Lourensford wines with cheese or nougat. Still hungry? The River Garden Deli has an extensive breakfast and lunch menu. Read more about Lourensford wine estate. Just before scenic, Sir Lowry’s pass, leading to the Hottentots Holland Mountain range, lies Waterkloof Wine Estate. In 1993, Frenchman Paul Boutinet bought the small property on the southern slopes of the Schapenberg range. Nowadays, Waterkloof has extended to both sides of the mountain. 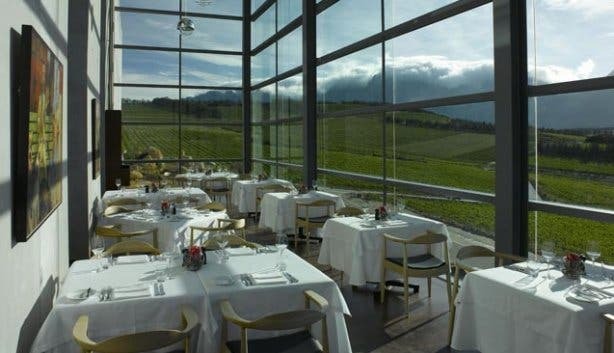 The vineyard has a rustic ambience, whilst the Waterkloof restaurant is ultra-modern. The restaurant has an amazing view of False Bay. And look back: the winery is surrounded by the Hottentots Holland mountain range and Schapenberg Mountain. Read more about Waterkloof Wine Estate. Take the left slip road to Sir Lowry's Pass Village, then proceed along the road for approximately 5.5km, and you'll come across a sign-board for Mount Rozier. The estates varying south easterly and south westerly slopes lie between 120 metres and 270 metres above sea level and are cooled by fresh ocean breezes. Combined with gravelly oak leaf and Hutton soils, this Mount Rozier is home to the perfect terroir. The Pioneer Blend is a unique composition of Cabernet Sauvignon, Shiraz and Merlot vineyards. Only 10km from Somerset West, Miravel Wine Estate is fast becoming one of the regions exciting, young estates. The cool breeze that sweeps up from False Bay creates perfect conditions for their maiden 2005 Sauvignon Blanc, which landed them a Bronze Veritas award in 2006. They've since introduced a second Sauvignon Blanc and the first of their reds. Why not stay the night in Fynbos Cottage? It's a charming, thatched-roof, 2-bedroomed building with magnificent views of the Helderberg Mountains. Hit the R44 again and turn left on the R102: Winery Road. Take the first left to Ken Forrester Wines, locally known as ‘The home of Chenin Blanc’. Owner, Ken Forrester, bought the property on the slopes of Helderberg Mountain in 1993, originally named Zandberg, in 1689. Icon wines of Ken Forrester wine estates are the FMC (Chenin Blanc, honeyed palate), Gypsy (Grenaz/ Shiraz) and the T Noble Late Harvest. 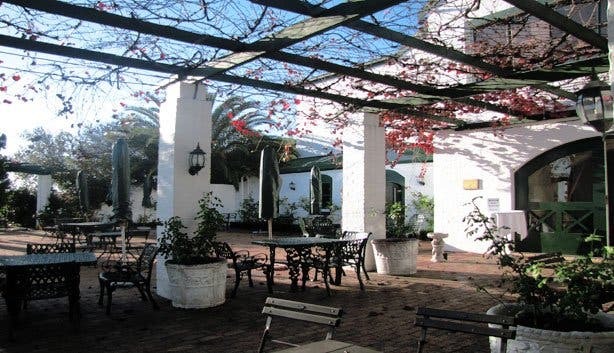 The charming wine farm, close to the Atlantic Ocean, offers romantic get aways in the Goose and Victorian cottages, with a view of the large dam and Helderberg mountain range. The second route in the Somerset West wine region is the Helderberg Foothills route. False Bay is a stone’s throw away from the Helderberg Mountain and the vineyards on the foothills of the mountain range benefit fully of the cooling ocean breeze. The vineyards on the foot of Helderberg reach elevations of 60 to 400 meters. Most popular wine blends on the Helderberg Foothill wine route are; Cabernet Sauvignon, Merlot and Shiraz. When driving from Somerset West towards Stellenbosch on the R44, turn right at Avontuur Wine Estate just before you cross the large dam. This family owned wine farm (since 1984) is situated on the south eastern slopes of Helderberg Mountain. Enjoy the views of False Bay from the terrace or lounge in front of the cosy fireplace inside. Avontuur’s flagship wine is the red blend Baccarat: a dense red wine with hints of plums, choc-mint, fynbos and black tea. 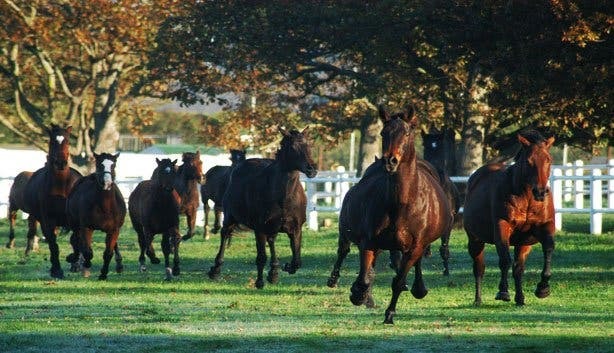 But wine is not the only passion of the Taberer family - they house over forty horses for breeding purposes. Read more about Avontuur Wine Estate. Drive back to the R44 and, just before the dam, turn right onto Eikendal Road. On your left you’ll see Longridge Winery. This wine estate was established in 1994 and taken over by the Van der Laan family in 2006. The position on the mountainside of Helderberg and the south easterly winds create ideal conditions for full and buttery wines. Every second Friday of the month Longridge invites you to enjoy a glass of wine and live music on the terrace while the sun sets over the Somerset West winelands. 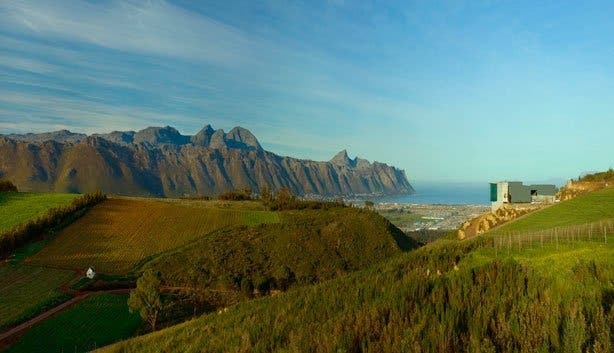 The Helderberg Annandale scenic wine route near Somerset West and Stellenbosch is part of the so-called Golden Triangle. The Triangle lies in the Helderberg mountain region and encapsulates the Helderberg Blauwklippen and Helderberg Annandale route. The vineyards, situated on the northern slopes of the Helderberg range, reach elevations of 150 to 300 meters. The unique location on the Helderberg slopes provides the vines with ultimate sunlight and cooling air. The wine estates on the Helderberg Annandale route are known for their classic wines: Chenin Blanc, Voignier and Petit Verdot. Off the R44 towards Stellenbosch – on Annandale Road - you’ll find the first wine estate on your left: Annandale Wine Estate. This wine farm is an estate with history: Annandale winery is the oldest estate in the Helderberg region and owned by rugby legend Gerhard ‘Hempies’ du Toit, since 1959. Dating back to 1688, the cellar has survived to this day. Nowadays, it serves as a cosy tasting room. Du Toit cultivates Cabernet Sauvignon (20 hectares), Cabernet Franc (3 hectares), Shiraz (12 hectares) and Merlot (10 hectares). The Shiraz 2003 is Annandale’s flagship: a full-bodied wine with a rich palate. When leaving Annandale Wine Estate, turn left on Annandale Road and pull up at Bilton Wine Estate. The first vines were planted in 1726, on this charming and rustic wine farm on the foot of the Helderberg mountains. The old cellar was built in 1824, which now serves as a tasting room, wine bar and restaurant. A cosy fireplace welcomes the visitor to sit down and indulge in the large leather chairs. The hearty red blends originate from granite and clay soils. The flagship wine of Bilton Wines is Sir Percy. From Haskell Vineyards drive back to Bilton wine estate on Annandale Road. Turn left at the second road. Boutique wine estate, Uva Mira Vineyards is your final destination on the Helderberg Annandale route. The family owned vineyard is the highest estate on the Helderberg Annandale route, located on 420 to 620 meters in a cool climate. From the highest point on Uva Mira you’ll be able to see all the way to Cape Point, Table Mountain and False Bay. Whilst enjoying the view take a sip of the Vineyard Selection Uva Mira: a blend of Cabernet Sauvignon (36%), Merlot (24%), Shiraz (23%) en Cabernet Franc (17%). The Vineyard Selection Red Blend is Uva Mira’s flagship wine. We do hear so much about the Stellenbosch wines and the Franschoek wine region, however the Somerset West winelands have always been there for the discerning wine lovers. The vineyards on the slopes of the Heldeberg and Schapenberg mountains have so much to offer: stunning views of False Bay, gorgeous surroundings and – most of all – delicious wines. The hidden gems of the Somerset West Winelands are definitely worth discovering. 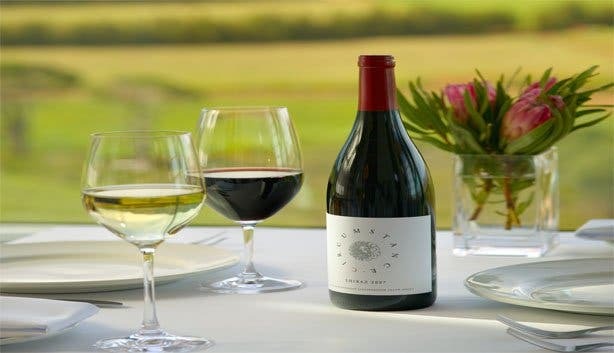 Curious to see and taste what the Cape Winelands have to offer? You’ll find an extensive overview of winelands near Stellenbosch, Paarl and Franschoek in our Winelands Section.